Hotel photography is business that requires overall attractive character and image. Even if you are a great photographer, you just have to come well prepared for the meeting with large or good rated hotel owner. Definitely, it is not enough to have only a good portfolio on your website, in order to gain customer confidence all image details must look flawless. Business cards like fashionable clothes and handmade shoes are an integral part of a good image and are perhaps the most important element for the first impression which determines the success of the meeting. Paulina and Matas are great photographers and a wonderful couple in their work and family life. They are so meticulous about their work and company image and perfectly understands that great success depends on many small but significant components. 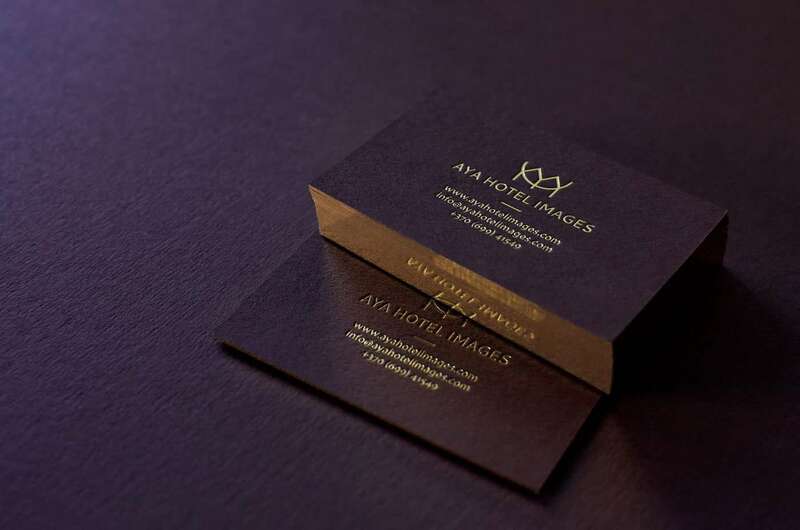 We are lucky to have a possibility to create and produce this so important special component to AYA Hotel Images. To create beautiful card design with such nice logo is quite easy. Business card design is simple and clear, red wine color premium this stock paper with gold foiled information and gold gilded edges makes solid and wow effect. Such business cards will certainly make a great first impression in any business meeting.